To Cite: Al-Shahethi A H, Bulgiba A, Zaki R A, Al-Dubai S A R, Al-Surimi K M, et al. Neonatal Mortality in the Eastern Mediterranean Region: Socio-Demographic, Economic and Perinatal Factors, 1990 - 2013, Iran J Pediatr. 2018 ; 28(1):e10485. doi: 10.5812/ijp.10485. Background: The neonatal mortality rate (NMR) is considered amongst the most important socioeconomic and health indicators of a community development. Globally, it has been reported that the daily mortality rate during the neonatal period is much higher (30-fold) than the post-neonatal period. In the Eastern Mediterranean Region, about 40% of the under-5 mortality occurs in the neonatal period. This study aimed to explore the association between the socio-economic, demographic and perinatal care related factors, and the neonatal mortality in the Eastern Mediterranean Region. Methods: The secondary data for the 1990 to 2013 on neonatal mortality rates, socio-demographic, socio-economic and health factors were extracted from official websites, including united nations children’s fund (UNICEF), world health organization (WHO), and united nations educational, scientific and cultural organization (UNESCO). Data were collected using the following keywords: ‘neonatal mortality’, ‘perinatal deaths’, ‘child health, education’, ‘expenditure on health’, ‘safe water’, ‘sanitation’ and ‘health indicators’. We used secondary data analysis to explore the relationship between the possible explanatory variables and neonatal mortality using correlation coefficient analysis. Results: There was a noticeable decline in neonatal mortality rates (NMR) among the Eastern Mediterranean countries from 1990 to 2013. The neonatal mortality rate had a negative and significant association with literacy status of both sexes, annual growth rates, antenatal care coverage, birth attendance by skilled health personnel, Gross National Income (GNI), total health expenditure per capita, safe drinking water and adequate sanitation facilities. However, the neonatal mortality rate had significant and positive relationships with maternal mortality ratio, total fertility rate, population size, total births and low birth weight. Conclusion: Despite the fall in the neonatal mortality rate, it remains high in the Eastern Mediterranean countries. Socioeconomic and other related factors appear to play a major role in determining neonatal mortality and there is an inverse relationship between socioeconomic status and the neonatal mortality rate. Neonatal health in Eastern Mediterranean countries needs a more effective and innovative approach to sustain the rapid progress in the overall reduction of child mortality. Neonatal mortality (NM) is a major public health problem that plays an important role in child mortality. The MDG Target 4.A is to reduce under-five mortality rate by two-thirds between 1990 and 2015 (1). Therefore, reducing NM becomes an important agenda for public health and international development agencies. Globally, it was estimated that the NMR decreased by 40% from 33 deaths/1,000 live births in 1990 to 20 in 2013. It has been reported that the NM alone accounts for more than half of infant deaths (2). However, if the MDG-4 is to be achieved, a considerable decrease in NM must be achieved. This implies that current global NM level of 20/1,000 live births should be reduced to less than 10. If there is no serious action to address NM, achieving MDG-4 will likely only be achieved by 2035 (3). The Sustainable Development Goals (SDG) framework expanded to include NM with all countries aiming to reduce NM to at least 12/1000 live births (4). Regionally, the Eastern Mediterranean region (EMR) had the third highest NMR in 1990 after the Southeast Asian and African regions (Figure 1). Seource: estemiates developed by the UN inter-agency group for child mortality estimation, report 2014. There is great disparity in the NM levels between and within countries of the region, ranging from 2/in Bahrain to 46/per 1,000 live births in Somalia. Somalia and Pakistan rank third and seventh among the 10 countries accounting for 67% of the global NM (5, 6). In the EMR, around 40% of under-five mortality take place in the neonatal period (Figure 2) which is clearly linked to poor status of maternal health among poorest sections of the population (7). In EMR context neonates have unique needs that currently fall between maternal and child health care services, to which need to be given special attention. The progress in child survival in EMR remains disparate. Between 1990 and 2013, eleven countries (Egypt, Bahrain, Lebanon, Oman, Tunisia, Iran, Saudi Arabia, Libya, Morocco, Qatar and Syria) reduced their under-five mortality rates by more than two thirds to achieve the MDG-4. However, large discrepancy in NMR is noted between the EMR counties e.g. Bahrain reached NMR of 2/1,000. As economic status and development of health services are closely related, it is noted that countries in the region classified as middle and high income showed the greatest reduction in NMR during the last 22 years (Figure 3). Other countries still show high NMR, such as Somalia and Pakistan, where NMR equals 46 and 42 per 1,000, respectively (3). Poverty, lack of resources, political conflict and war are some of variables that lead to this high rate of mortality. Source: united nation, Inter-agency group for child mortality estimation (UN) IGME), 2014. The main leading cause of NM in the EMR in 2013 was prematurity (33.8%) and congenital abnormalities in countries with low NMR (≤ 20/1,000 live births) (4), whereas in countries with high NMR (> 20/1,000 live births), it was acute respiratory infection, diarrhoea, asphyxia, neonatal sepsis and measles (8) (Figure 4). Source: WHO, global health observatory data repository, 2013. In this study, since the countries in EMR are comparable to each other, taking in consideration the similarities in the culture, tradition, and geographical location, it is possible to obtain a real picture of the epidemiological profile of distribution and determinants of NM in the region. Thus, this study aimed primarily to describe and compare the NM rate among the EMR countries, to recognize the possible determinants the NMR and to obtain sufficient knowledge and understanding concerning what future efforts are required to make significant improvements to improve the health of neonates in the countries of the region. Data that were attributed to NM were collected and categorized into demographic, social, economic and perinatal health care. The data used in this study were obtained from the official websites of the WHO; UNICEF, united nations children’s fund; regional health observatory data repository available (9); as well as UNESCO. The data were identified using the following keywords: NM, perinatal deaths, child health, education, health expenditure, safe water/sanitation, health indicators and causes of child deaths for all 22 countries in the EMR. Any data before 1990 were excluded. The WHO defined the NMR as the death of children in the first month of life in a given year divided by the total number of live births in the same year (10). The NMR is expressed per 1000 live births and compared for the EMR countries for 2013. The Independent factors related to neonatal mortality were classified into demographic, social, perinatal care and economic and were considered quantitative variables. The demographic factors studies were: a, the total population size; b, the annual total births; c, the annual growth calculated as the average percentage change in population size between 1990 and 2013; and d, the total fertility rate calculated as the number of children born to a woman of reproductive age. The social factors considered was male and female adult literacy rates calculated as the percentage of people aged 15 - 24 years who can read and write. The intrauterine fetal period (≥ 28 weeks gestation), in combination with early neonatal period (0 - 6 days after birth) is called perinatal period. The Health factors included the percentage of low birth weights (< 2500 g at birth), maternal mortality ratios (the annual number of deaths of women from pregnancy-related causes per 100,000 live births), antenatal care coverage, the percent of women aged 15 to 49 with a live birth within a given time period who attended at least one visit and the percent of births attended by skilled health personnel was calculated as the total of births attended by skilled personnel during the reference period over the total of live births occurring within the reference period. The economic factors included the annual gross national product (GNP) per capita expressed in United States Dollars, the total expenditure on health per capita and the proportion of the population with access to safe drinking-water and adequate sanitation facilities (11, 12). The secondary data were collected, entered and analyzed using SPSS package (Version 22). Spearman rank coefficient analysis was implemented for the purpose of identifying relationship between NM and the independent variables such as demographic, socio-economic and perinatal. The data in 1990 were only used to identify the percentage of the decline in NM from 1990 to 2013. After that we arranged the variables for the countries of the region in ascending order. 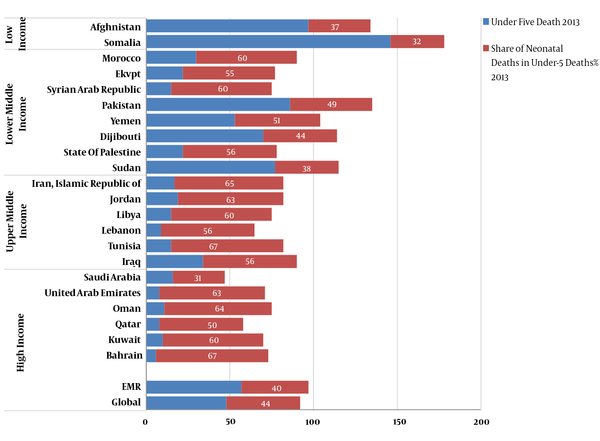 The NMR in the EMR countries in 2013 ranged from 2 to 46 deaths per 1000 live births (Table 1). The EMR countries were classified into three categories as follows: first category included the countries with lowest rates of NM (≤ 10 deaths per 1000 live births); these included Bahrain (2/1000), Qatar (4/1000), Kuwait (5/1000), United Arab Emirates (5/1000), Lebanon (5/1000), Oman (7/1000), Syrian Arab Republic (8/1000), Libya (9/1000), Saudi Arabia (9/1000), Tunisia (9/1000) and Iran (10/1000). The second category included countries with moderate rates (> 10 to 25/1000 live births); this category included Jordan (11/1000), Egypt (12/1000), the State of Palestine (12/1000), Morocco (18/1000) and Iraq (19/1000). aSources: United Nations Children’s Fund (UNICEF), September 2014. The third category included countries with highest rates (> 25 deaths per 1000 live births); this category included Yemen (26/1000), Sudan (30/1000), Djibouti (31/1000), Afghanistan (36/1000), Pakistan (42/1000), and Somalia (46/1000). Therefore, a decline in NM rate was found in all EMR countries from 1990 to 2013, while lowest decrease was found in the State of Palestine and Somalia, which showed a 5% and 8% decrease in rate, respectively. The data analysis showed that there is a noticeable reduction in the NMR ranging from 5% in Palestine to 75% in Bahrain. A visible falling in the rate was observed more in Lebanon, Egypt and Tunisia. As illustrated in Table 2, the NMR in 2013 was viewed to be significantly positive and strongly correlated with the total fertility rate (TFR) (r = 0.82, P < 0.001), and moderately and positively correlated with the total population size (r = 0.54, P = 0.001) and total birth (r = 0.48, P = 0.025). The EMR was negatively correlated with the annual growth rate but the P value was borderline (P = 0.050). The GCC countries had a low annual growth rate except for Kuwait, Qatar and Bahrain compared with Pakistan and Egypt, which had the largest total population and the highest annual total births; however Somalia and Pakistan were classified among those with the highest NMR. On the other hand, in terms of annual growth rate, Kuwait, Bahrain and Qatar were the highest among the countries. bP value: Significance level, 95%. The literacy rate (Table 3) ranges from 41% to 99% for males and 17% to 99% for females. Kuwait, Qatar, United Arabia Emirates, Lebanon and the State of Palestine seem to be able to reduce gender distinction in education. However, with respect to chances of education in Afghanistan, Somalia, Morocco and Yemen, significant differences were seen between the males and females. The NMR was negatively and significantly correlated with both male (r = -0.78, P = 0.001) and female literacy rates (r = -0.82, P = 0.001). In addition, the NMR was positively and significantly correlated with the male/female literacy ratio (r = 0.83, P = 0.001). As shown in Table 4, the percentage of low birth weight ranged from 2% to 32%, maternal mortality extended from 6 to 850 deaths per 100,000 live births, antenatal care coverage with at least one visit ranged from 40% to 100%, and birth attended by skilled personnel ranged from 33% to 100% (Table 4). The NMR was positively and significantly correlated with the maternal mortality ratio (r = 0.90, P < 0.001), and negatively correlated with antenatal coverage (r = -0.80, P = 0.001), and birth attended by a skilled personnel (r = -0.78, P = 0.001). There was a weak positive correlation between NM and birth weight but the P-value was not significant. Somalia, Afghanistan, Sudan, Djibouti and Yemen had the lowest perinatal care indicators; therefore, these countries had the worst perinatal care indicators. The results analysis showed that the economic factors vary markedly within the EMR (Table 5). The annual gross national product (GNP) per capita in 2013 ranged from US$ 284 to US$ 92,789 while the total expenditure on health per capita ranged from US$ 17 to US$ 2,029. The highest GNP and total expenditure on health per capita were mainly reported in the GCC countries followed by Lebanon. The annual GNP per capita and the total expenditure on health were negatively correlated with the NMR (r = -0.90, P < 0.001; r = -0.89, P < 0.001), respectively. The populations with access to safe drinking water ranged from 29% to 100% compared with those who had access to adequate sanitation facilities ranged from 23% to 100%. Nevertheless, the NMR had significantly negative correlation with those having access to safe drinking water (r = -0.83, P < 0.001) and adequate sanitation facilities (r = -0.88, P < 0.001). The comparison that we made to the NMR among the EMR countries with a utility value was for the purpose of evaluation of the current situation and inputs for future planning improvement. The analysis of the mortality rate provides a real means for comparison, particularly in countries with different health status and health system policies. The results of this study illustrated that there are substantial differences in the NMR among the countries of the region despite the fact that these countries share many common culture and traits, including early marriage, frequency of marriage and inbreeding (13, 14). All of these factors combined, affect health of neonates. It is noted that differences still exist in NM between the countries of the region. 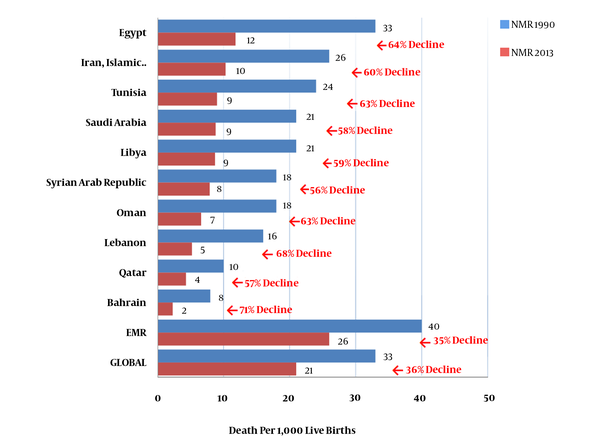 Our findings showed that the EMR can be grouped under three categories regarding the NMR; The GCC countries that form the first category with the lowest rates (≤ 10 deaths per 1000 live births); the second category with rates from > 10 to 25 deaths per 1000 live births include Jordan, Egypt, the State of Palestine, Morocco, Iraq; and the third category with the highest rates exceeding 25 deaths per 1000 live births comprise Yemen, Sudan, Djibouti, Afghanistan, Pakistan and Somalia. However, there was a clearly noticeable decline in the NMR between 1990 and 2013 in all the countries, except for Somalia and the State of Palestine, which indicates that great efforts have been exerted to improve the health care services quality and facilities availability. In this time period, Somalia and the State of Palestine are unique in sense that their situation reflects impact of war on humanity and highlights the need to rescue neonates in these countries from the consequences of poverty, lack of resources, political conflict and sanctions that contribute to this high rate of mortality. At the same time and in the following years prevailed the same extreme conditions in Afghanistan, Syria, Iraq, and much harder in Yemen. Our data analysis also demonstrated the impact of the demographic, social, economic and perinatal care factors on neonatal mortality (15, 16). The main demographic determinant was TFR that appeared very strongly associated to the NMR, while the total birth rate and the total population were weakly correlated with the NMR. There was a negative correlation between the NMR and the annual growth rate where the reason may be due to increase in population density from country to others. Pakistan and Egypt had the highest total population size with annual total births amongst the relatively high fertility rates and annual growth rates. In addition, Somalia and Pakistan were categorized among those countries with the highest neonatal mortality rate. The rapid progress of the Arabian Peninsula countries over the last two decades clearly reflected the remarkable decline in the neonatal deaths rate due to the different health care for neonates, which could be explained by the circumstances and problems of each individual country. However, it is of some concern that the Arabian Peninsula countries had the highest annual growth rate and fertility rate, especially in Kuwait, as evidenced by the relative rise in population and the total number of annual births. The literacy rate among males and females showed an inverse relationship to the NMR. This reflects the paramount role of socio-economic development and its impact on improving the health status of neonates, and also explains previous reports (17, 18). This factor was found as well in previous study carried out by Abuqamar et al. on the impact of parental education on infant mortality in the Gaza strip. They found a significant inverse correlation between parental education and the survival of infants, where families with low educational levels attainment had a much higher risk of infant mortality (19). Positive relationship with male to female literacy ratio found in this study suggest that the role of literacy and education among mothers is an important factor for improving NMR. This also can be seen with the stronger inverse relationship with NMR for female literacy as compared to male literacy. A high association exists between the education of the female or literacy level and use of the reproductive, maternal and child health services. The NM levels are significantly higher in countries with a high rate of female illiteracy, which is evident in the region (10). The findings of our study also demonstrated a clear gap between men and women in terms of education opportunities in the countries of the region, which, in turn, indicated the existence of a direct relationship with NMR. In this study, our findings on health factors are in alignment with previous studies in both developing and developed countries, in that they showed the real effects of antenatal care and the birth attendance by skilled health personnel on perinatal outcomes. These included the reduced rates of maternal deaths and low birth weight that are used as quality performance indicators for the perinatal care offered in a society (20), and hence explain some of the differences in NMR among the EMR countries. This indicates the great importance of improving access and quality of the perinatal care coverage and health services offered in the community to reduce mother and child deaths. As shown in Figure 5, in many countries of the EMR region, there is a marked variation in the economic situation, which is inversely correlated with the NMR. A large variation in total expenditure on health per capita and neonatal mortality is also observed within different SE status of the countries of the EMR, in which the correlation between NM and the expenditure on health per capita is inverse. This study found that economic factors were strongly associated with inverse NMR. The impact of economic development, maternal education improvement and perinatal health care services through the low-cost, community-based interventions, are evidenced by the success of Qatar, where, over a period of more than 35 years, these developments have had a strong impact on maternal, neonatal, and perinatal survival (15). However, poverty is not just a problem in poor countries; it can also result in disparities between the richest and poorest of the populations of the same country. Therefore, there is a need to focus on drawing attention to the important role of securing sustainable economic growth and its impact on the availability of health services. Through the analysis of health accounts in the countries of the EMR region for the middle and low income, most countries showed that the percentage of total expenditure on health of gross domestic product (GDP) has decreased over time. This leads to a deterioration in the health and equity in the financing of health care (21). The result of the study enhances the imperative need for action for continuing efforts in the EMR region to improve neonatal health and reduce neonatal mortality, and for intensive and accelerated action to empower every women by giving the best opportunity for getting safe and clean birth delivery so that every child has the best possible start in quality of life (22). To scale up efforts to improve the health status of maternal and child health in the EMR Region, the initiative “Saving the lives of mothers and children” was jointly launched by WHO, UNFPA and UNICEF with Member States in a high-level meeting held in Dubai, United Arab Emirates, in January 2013. The meeting concluded with the Dubai Declaration, which was endorsed by the 60th session of the regional committee for the Eastern Mediterranean in October 2013. The main goal of the meeting was to scale up efforts to improve the health status of maternal and child health in the region, and for the high burden countries to commit to developing, launching and implementing maternal and child health acceleration plans to move forward the MDG agenda. In this sense, there is a need to coordinate efforts and direct them according to four priorities: the first is to encourage communities through the work of campaigns and activities of the awareness of the importance of education for members of the community and the positive relationship with children’s lives through the reduction of early marriage and childbearing; in addition, to reduce the number of children and take advantage of the care services in the different stages of pregnancy in the community to increase awareness of the health and hygiene promotion standards. The second priority is the position of neonatal health in the health policies and strategies for all countries of the region, and to recognise it as an important stage of the child. NM represents almost 40% of all under-five deaths, possibly because the health of babies has a close relationship with the mother’s health. An appropriate maternal health care in pregnancy and the post-natal stage leads to a reduction of mortality and morbidity among neonates. However, the care needs of neonates are of a different kind. At the moment, the health care for mothers and children in the region, must address this issue and select appropriate and effective interventions according to the differences within the country, ensure access for the neediest and provide high quality service for antenatal, newborn and postnatal care, as well as continuous education and the training of health professionals who can reach the marginalized and poorest sectors of the population. Monitoring mechanisms should be in place to ensure the implementation of the policies and measure the achievement of the set national goals. Countdown for 2015 is one such initiative that could be used at the country level to assess progress and coverage (23). In addition, there is a need for the establishment of a consumer-provider relationship, as well as a need to focus on the delivery strategies and mechanism for scaling up coverage in the short term. These include innovations for demand creation and service delivery, as well as the removal of financial barriers (24). The third is to strengthen the health system, in particular the health information system, to be able to track neonatal indicators, which are crucial for sound planning, successful implementation of interventions and monitoring of achievements as well as to reinforce the vital registration system (birth and death certificates) to assist in validating the data available on maternal and neonatal mortality. Two studies conducted in 10 governorates in Yemen in 2005, showed that the availability of basic emergency obstetric care services are extremely limited and maternal newborn health (MNH) services are underutilized in the assessed governorates: (skilled birth attendance around 20%; cesarean proportion less than 1%; and the case fatality rate for obstetric complications > 1%). Both studies revealed a very poor level of data quality: “All the registers available in each of these assessed facilities were accessible but most of them are of poor quality; either the register was not up to date or/and filled out incompletely. This negligence of data use contributes to poor quality of registers and records available (25, 26). The fourth is the importance of integrating research into the maternal, neonatal and child health acceleration plans and beyond, with a focus on operational or implementation research designed to overcome local barriers and ensure the implementation of strategies that are known to be effective. Capacity building in research methods was identified as a need to be addressed, including through collaboration with local and regional research institutions. A common motif running through all the presentations was the need for technical support and capacity development in both the technical aspects of maternal, neonatal and child health as well as in the strengthening, research and monitoring, and evaluation efforts of health systems. It was also suggested that small-scale surveys could be implemented in the target areas in order to generate data on service utilization (27). Conclusion: Despite the fall in the neonatal mortality rate, it remains high in the EMR countries compared to developed countries. It has been shown that the (GNP, total expenditure on health, safe water/ sanitation, and female literacy were negatively correlated with the neonatal mortality rate. On the other hand, the maternal mortality ratio, male/female literacy ratio and TFR were positively correlated with the neonatal mortality rate. Therefore, neonatal health needs to be addressed with a more effective and innovative approach that target support and capacity development of maternal, neonatal and child health services in order to continue and sustain the rapid progress made in reducing the overall reduction of child mortality. The Eastern Mediterranean Region countries needs to focus on the improvement of the total of expenditure on health services of GDP, adequate allocation of financial resources to child health, sufficient qualified human resources and high turnover of qualified staff at all levels and addressing disparities within the EMR countries. Reduction in poverty improvement in social and living conditions e.g. adequate sanitation and clean drinking water is prerequisite. Establishing and adoption of the strategy to accelerate the reduction of maternal and neonatal morbidity and mortality through improvement of the availability, accessibility and utilization of essential maternal and neonatal health services and improvement in its quality, as well as enhancement of educational awareness on child survival by delaying marriage, avoid early childbearing, using family planning strategies to reduce the number of children and make practical and effective use of prenatal care services are recommended. Monitoring mechanisms should be in place to ensure the implementation of the policies and measure achievement of the set national goals. Results of this manuscript may serve as an important source of information to guide the public health policy makers and health care providers to design interventions to reduce child mortality. This report was part of the first author’s Ph.D course requirement submitted in 2016 to the University of Malay. I am grateful to my supervisor Prof.Dr. Awang Bulgiba Awang Mahmud for his kind, meticulous, experienced and confident guidance. I can’t find satisfactory word to express my gratefulness to them for encouragement, patience and valuable supervision. Also I wish to thank all the professors, teachers and staff in the Department of Social and Preventive Medicine in University of Malaya (year 2015 - 2016), for providing me with the information enabled me to perform this research work. 1. United Nations . The Mellenium Development Goals Report. United Nations; 2012, [updated 2012]. Available from: http://www.undp.org/content/undp/en/home/librarypage/mdg/the-millennium-development-goals-report-2012.html. 2. United Nations Children's Fund . Levels and trends in child mortality report Estimates developed by the UN Inter-agency group for child mortality estimation. 2012, [updated 2012]. Available from: https://www.unicef.org/media/files/2013_IGME_child_mortality_Report.pdf. 3. United Nations Children's Fund . Committing to Child Survival : A Promise Renewed, progress report. UNICEF; 2014, [updated 2014]. Available from: https://www.unicef.org/publications/index_75736.html. 4. World Health Organization . Global Health Observatory (GHO) data, Distribution of causes of deaths in children under-5 by country. World Health Organization; 2013, [updated 2015]. Available from: http://www.who.int/gho/countries/en/. 5. United Nations Children's Fund . Committing to Child Survival: A Promise Renewed, Progress Report UNICEF. 2013, [updated 2013]. Available from: http://www.apromiserenewed.org. 6. World Health Organization . Neonatal mortality in the Eastern Mediterranean Region: determinants and strategies for achieving Millennium Development Goal no. 4. World Health Organization; 2007, [updated Jan 2015]. Available from: http://s3.amazonaws.com/zanran_storage/www.emro.who.int/ContentPages/110089878.pd. 7. Liu L, Johnson HL, Cousens S, Perin J, Scott S, Lawn JE, et al. Global, regional, and national causes of child mortality: an updated systematic analysis for 2010 with time trends since 2000. Lancet. 2012;379(9832):2151-61. doi: 10.1016/S0140-6736(12)60560-1. [PubMed: 22579125]. 8. World Health Organization & United Nations . Country statistics and global health estimates by WHO and UN partners 2013. [updated 2015]. Available from: http://www.who.int/healthinfo/global_burden_disease/en/. 9. World Health Organization . World Health Statistics. World Health Organization,; 2014, [updated 2014]. Available from: http://www.who.int/gho/publications/world_health_statistics/2014/en/. 10. World Health Organization . Demographic and health indicators for the Eastern Mediterranean. World Health Organization,; 2006, [updated 2006]. Available from: http://webcache.googleusercontent.com/search?q=cache:YG_hrbRolGAJ:www.who.int/iris/handle/10665/116497+&cd=1&hl=en&ct=clnk. 11. World Health Organization . Framework for health information systems and core indicators for monitoring health situation and health system performance Regional Office for the Eastern Mediterranean. World Health Organization; 2014. Available from: applications.emro.who.int/dsaf/EMROPUB_2014_EN_1792.pdf. 12. World Health Organization . Demographic, social and health indicators for countries of the Eastern Mediterranean Regional Office for the Eastern Mediterranean. EMRO Publications; 2013. Available from: http://www.who.int/iris/handle/10665/116863. 13. Shawky S, Milaat W. Early teenage marriage and subsequent pregnancy outcome. East Mediterr Health J. 2000;6(1):46-54. [PubMed: 11370340]. 14. Tadmouri GO, Nair P, Obeid T, Al Ali MT, Al Khaja N, Hamamy HA. Consanguinity and reproductive health among Arabs. Reprod Health. 2009;6:17. doi: 10.1186/1742-4755-6-17. [PubMed: 19811666]. 15. Rahman S, Salameh K, Bener A, El Ansari W. Socioeconomic associations of improved maternal, neonatal, and perinatal survival in Qatar. Int J Womens Health. 2010;2:311-8. doi: 10.2147/IJWH.S12426. [PubMed: 21151678]. 16. 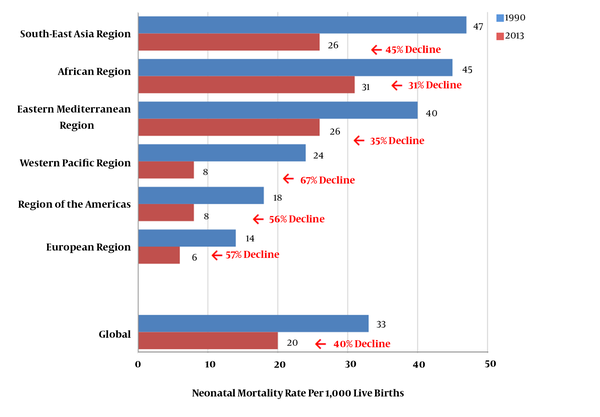 Sajjad UR, Walid E. Neonatal mortality: incidence, correlates and improvement strategies. In: Ezechi OC, Odberg‐Petterson K, editors. Perinatal Mortality. Croatia: EUROPEAN UNION: Intech Publishing; 2012. p. 37-72. 17. Houweling TA, Kunst AE. Socio-economic inequalities in childhood mortality in low- and middle-income countries: a review of the international evidence. Br Med Bull. 2010;93:7-26. doi: 10.1093/bmb/ldp048. [PubMed: 20007188]. 18. Upadhyay RP, Dwivedi PR, Rai SK, Misra P, Kalaivani M, Krishnan A. Determinants of neonatal mortality in rural Haryana: a retrospective population based study. Indian Pediatr. 2012;49(4):291-4. [PubMed: 21992859]. 19. Abuqamar M, Coomans D, Louckx F. The impact of parental education on infant mortality in Gaza strip, Palestine. J Public Health and Epidemiol. 2011;3(1):28-33. 20. Titaley CR, Dibley MJ, Roberts CL. Type of delivery attendant, place of delivery and risk of early neonatal mortality: analyses of the 1994-2007 Indonesia Demographic and Health Surveys. Health Policy Plan. 2012;27(5):405-16. doi: 10.1093/heapol/czr053. [PubMed: 21810892]. 21. World Health Organization . Strategic directions to improve health care financing in the Eastern Mediterranean Region: moving towards universal coverage 2011-2015. Cairo, Egypt: World Health Organization; 2010. Available from: applications.emro.who.int/docs/EM_RC57_tech_disc_1_en.pdf?ua=1. 22. World Health Organization . Summary report on the high-level meeting on saving the lives of mothers and children: rising to the challenge in the Eastern Mediterranean Region, Dubai, United Arab Emirates, 29–30 January 2013. 2013. Available from: http://www.who.int/iris/handle/10665/116170. 23. Requejo J, Bryce J, Victora C. Countdown to 2015 Maternal, New Born and Child Survival: Building a Future for Women and Children: the 2012 report: WHO; UNICEF. 2012. Available from: http://webcache.googleusercontent.com/search?q=cache:qCEE69F5R9cJ:pesquisa.bvsalud.org/enfermeria/resource/en/per-2390+&cd=2&hl=en&ct=clnk. 24. Lassi ZS, Bhutta ZA. Community-based intervention packages for reducing maternal and neonatal morbidity and mortality and improving neonatal outcomes. Cochrane Database Syst Rev. 2015;(3). CD007754. doi: 10.1002/14651858.CD007754.pub3. [PubMed: 25803792]. 25. Al Serouri AW, Al Rukeimi A, Bin Afif M, Al Zoberi A, Al Raeby J, Briggs C, et al. Findings from a needs assessment of public sector emergency obstetric and neonatal care in four governorates in Yemen: a human resources crisis. Reprod Health Matters. 2012;20(40):122-8. doi: 10.1016/S0968-8080(12)40665-6. [PubMed: 23245417]. 26. Abdulghani NA. Situational analysis on emergency obstetric care in public hospitals Sana'a, Yemen: Yemeni-German Reproductive Health Programme YG-RHP; USAID. 2006, [updated Nov 2012]. Available from: pdf.usaid.gov/pdf_docs/PA00JSDM.pdf. 27. World Health Organization . Summary report on the Technical meeting on maternal and child health acceleration plans. Cairo, Egypt: World Health Organization; 6-7 February 2014. 2014. Available from: http://applications.emro.who.int/docs/IC_Meet_Rep_2014_EN_15286.pdf.